FM8 is a great synth for those tight tempo synced bass and lead sounds and some seriously cool grooves can be achieved. We will use tempo synced envelopes in combination with “silent” operators to achieve groovy bass sound but this technique can be used elsewhere and next time we will look how to create lead sounds using very similar technique. 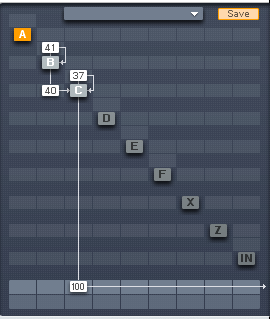 Here is the midi sequence I am using trough out this tutorial. Set it’s self oscillation value to 37 to add some harmonics. Sync the envelope and set it to loop 1/8 of a bar. Remember, if we want it to be looped we have to add another breakpoint between the two loop markers or else the envelope won’t loop (It needs at least two breakpoints to loop). Now let’s go set the Unison page in the Master section. 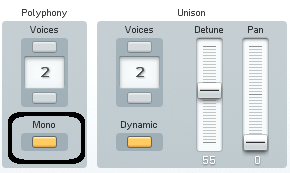 Set both Polyphony and Unison voices to 2 for now. Also set the Mono button on. This forces FM8 not to retrigger the envelopes if the notes are overlapping. This way we can play different notes but keep envelopes looping without re-triggering them. Sync it’s envelope and set it like this. Also set velocity parameter to 30. Set operator B to modulate operator C with amount of 40. Now here is the trick. If we set operator C ratio to 0 it means operator C won’t be heard anymore because it’s frequency is zero. But because we are modulating it with operator B we will hear operator C only when it’s frequency is modulated and thus non-zero. And since we have rhythmic envelope in operator B this will result in a sort of a gating effect but not just that since the timbre is also being changed at the same time. This way you can create some cool sequences. If you want more pronounced sound raise the self oscillation amount to 41. Here you can hear the sound played in two different octaves, 8 bars each. I have also added simple drum sequence. No other effects are used in these samples except for some EQ and limiter on the master channel for some extra loudness. Now we can take this even further. Enable operator D and sync it’s envelope and set it to something like in the picture below. Now route operator D to operator C with amount of 38. So now there is also operator D “triggering” operator C.
Also try setting ratio of operator D to different higher (or lower) values so you can add more frequency content of your choice to the basic waveform of operator C.
We could also modulate operator B instead of operator C. This produces a bit different effect. Now let’s set also operator B ratio to zero and use operator D to “excite” operator B. This will result in even more complex sequence and also in different, more aggressive sound. I have also changed the slopes of envelope B to get more bass else it is being choked too much. You can hear more dirt in the sound now. We could also add operator A to also modulate operator B introducing even more dirt in to the sound. Try changing self-oscillation amounts and modulation values to achieve different variations but most importantly play with operator B envelope to achieve different grooves. Here is one extreme variation I particularly like (Changed the envelopes, ratios and modulation amounts, the sequence is the same). Only drum loop and one instance of FM8, no other sounds used. Ratio values have great effect on the overall sound. Try to set operators A-D to something like this. This strongly affects the sound (the midi sequence was not changed). You can hear this results in a completely different sound but still with strong resemblance to the original sequence. So you could effectively use these variations as a different bass line parts in your song. Here are few variations of the same patch playing the same midi sequence to give you the idea. Beside EQ I have also added touch of delay to some patches. No other effects used. This is it for this tutorial. In the next one we will look how to create and modulate lead sound using similar technique. If you don’t understand something or have any other questions or comments feel free to leave them below.